Get a 2nd Pressure Cooker for Half Price! 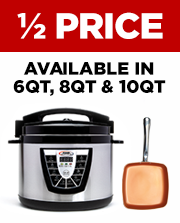 You can get a 2nd Power Pressure Cooker XL for 1/2 Price! Each additional 6 Qt is just $49.95 + $29.99 S&H, 8 Qt is just $64.98 + $29.99 S&H, and 10 Qt is just $79.95 + $29.99 S&H. Please select the quantity you would like to add to your order. Don't Forget to Add the Lid! Your Copper Chef pan can be used to cook almost anything! That is why most of our customers are adding the glass lid to their order. Each lid if only $14.97 plus no additional S&H. 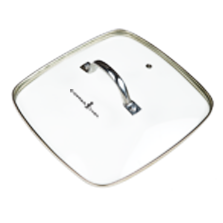 The lid includes a steam release vent and lets you simmer, steam and more! Select 'YES PLEASE' to upgrade each pan to include the lid! Select Upgrade Yes Please! No Thank you! 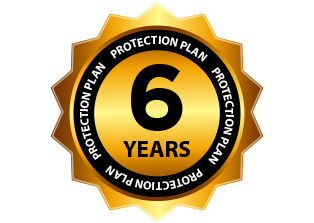 We know that life happens – whether accidents, power surges or general wear and tear – so we developed our 6-year Protection Plan that you can add to your order for just $30.00.